Stories of the Chupacabra seem to have originated in Puerto Rico in the mid 1990’s, but there are many stories connected to the “goat sucker” that can be traced around the world. From Indonesia and the Philippines 200 years ago to modern discoveries in ancient Mayan text Camazotz over 600 years ago. The mystery of the chupacabra. Modern sightings taking place in March of 1995 took place in Puerto Rico. Several sheep were found dead and completely drained of blood. When the 8 sheep were examined, there were similarities to recent catlle mutilations in the American southwest. There were 3 puncture holes in the chest of each animal and missing a large quantitiy of blood. Eye witness descriptions of the Chupacabra vary but it is described as a stout creature that is approximately 5′ tall standing upright, about the size of a small bear, lizard like with a row of spines on it’s back from it’s forhead to it’s tail. The creature is said to have upper and lower fangs in its mouth. Some people have said it is capable of “flight” while others have said due to the powerful back legs, the Chupacabra is simply able to leap great heights or distances. 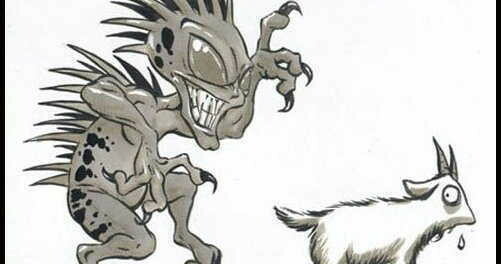 Officially, government agencies say the Chupacabra is an urban legend with no real evidence that it exists, however in late 2000, a farmer in Nicaraua, Jorge Luis Talavera was able to shoot what he said was the creature and killed it. The carcass, after an “official” analysis, was determined to be that of a dog. Talavara said the carcass was switched while in the posession of the examiners. Is the Chupacabra a cryptozoological mystery or is it normal predators in the wild that are mis-described by people in stressful situations? You decide. If you have any Chupacabra stories or sightings of your own, please contact us by leaving a comment below!